“Top birdstones have sold privately for $800,000 to $900,000. Because of its mystical and unique blue halo, the Parks Birdstone should set a world record price on May 17th – not only for a birdstone, but also for any North American prehistoric art object,” said John Mark Clark, the department head and specialist who is supervising the auction. Another premier entry is an 8-inch-long translucent orange kaolin flint Ross blade from the Hopewell culture that flourished along rivers in the northeastern and Midwestern United States from 200 BC to 500 AD. An exalted ceremonial piece, the blade is described by Clark as “exotic ceremonial regalia, so rare it would have been reserved for only the most elite. Now, many centuries later, it is still a prize suitable for only the most select, high-end collection.” The Ross blade is expected to make in excess of $200,000. Trophy game stones or, “discoidals,” are well represented in the auction. An exquisite, double-cupped example displays impeccable balance and form, while other highly desirable discoidals include one of red and white “flint” with highly polished cups, three exquisite Jersey Bluff-style quartz discs and several of Cahokia style. What is considered to be the finest cache of Dover flint Copena points yet discovered will add excitement to the auction, along with Earl Townshend’s monumental 7-inch Corner Notch Blade. An incredible translucent “white-tipped” sugar-quartz Clovis point is also included in the sale, along with a tremendous Agate Basin spear and coveted projectile points from all cultural time periods. Prehistoric Caddo and Mississippian-Era pottery will be available, including a solid, unrestored Caddo effigy duck bowl and several pottery bottles and bowls engraved with rare Caddo motifs. A huge human “rattle-head” Mississippian bowl (restored) with a fantastic hairstyle will also be auctioned. A fine selection of bannerstones includes a ferruginous-quartz hourglass, a speckled-granite rectangular barrel, and a saddleback-style banner of colorful speckle-chunk granite. Perhaps the rarest of the group is an exquisitely made wiry-granite butterfly banner with an engraved barrel, one of only two known. Another auction highlight is a pair of museum-grade Southern “Dallas” culture limestone ear spools. The prehistoric wearable artworks retain remnants of their original copper-foil covering. In addition to the satisfaction prehistoric artifact collectors derive from owning remarkable pieces of history such as those to be sold on May 17th, Clark says many in the hobby regard the objects as solid investments. 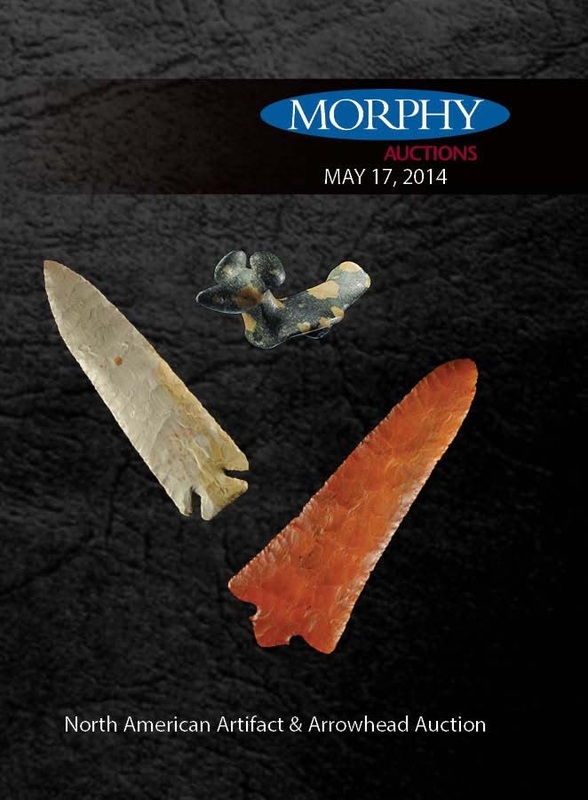 Morphy’s Saturday, May 17 Prehistoric American Artifacts Auction will begin at 9 a.m. Eastern Time. All forms of bidding will be available, including live online through Morphy Live (www.morphyauctions.com), LiveAuctioneers, Proxibid or Invaluable. For additional information on any item in the sale, call 717-335-3435 or email info@morphyauctions.com.